These are a plant based twist on my old recipe and, dare I say it, I think they’re even better than the original. Seriously. 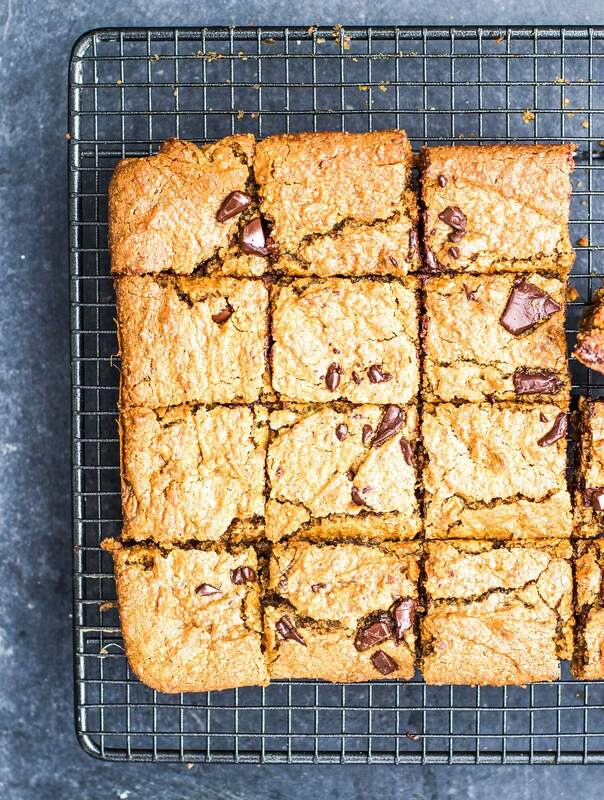 The other ones were one of the most loved recipes on this website and I’ve loved them myself for years but these are even better. 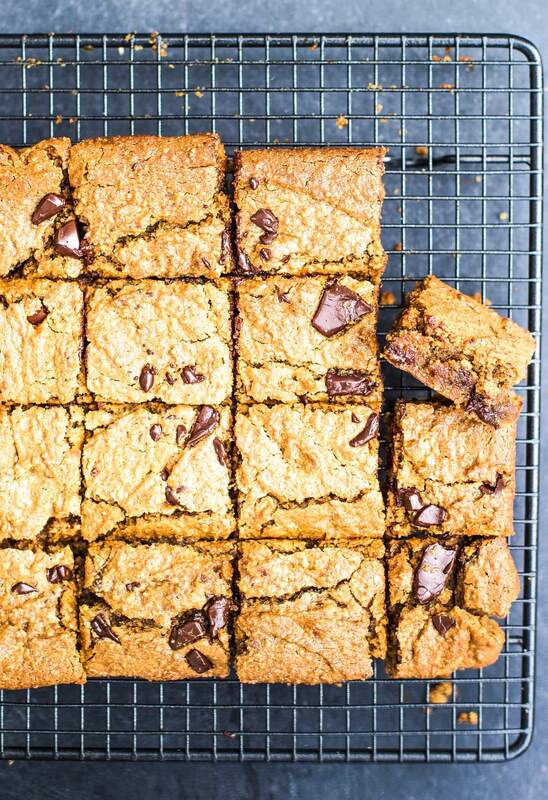 They are blondie perfection and an absolute must try. Can’t wait to hear what you guys think of them! Add the chickpea water (keep the chickpeas for something else), vanilla, coconut sugar and flaxseed to a small saucepan on medium heat. Whisk until the sugar is completely dissolved. Use an electric whisk to combine the nut butter and sweet chickpea water mixture in a large bowl. Pour in the melted coconut oil and whisk until well combined. In a seperate bowl, mix together the baking powder and ground almonds. Then add them to the wet ingredients and mix well. Roughly chop your chocolate into chunks and then mix them into the batter. Line a baking tin with parchment paper and pour in the mixture, spreading it around evenly. Bake at 180’C for about 30 minutes- I like them fudgey so I take them out even if they look a little bit undercooked. Leave them to cool for about 20 minutes before slicing. Thanks so much for this…my 8 yr daughter is gluten, dairy, yeast, egg free at the moment so this will be a great treat for her! I’ll substitute the dark choc for dairy free so hopefully this will be a hit, most shop bought goods taste pretty awful and it’s proving quite challenging to make things that are free from all of the above, especially with breads! ???? Hi Indy, could you use coconut flour (or other form of flour) instead of ground almonds? My husband cannot eat almonds! Hi Indy thanks so much for this recipe!! Could I substitute the coconut sugar…I cannot have any type of sugar? I usually use Stevia, would that be ok? And can the nut butter be almond or peanut butter? Made these this morning with my 3 year old. They are scrumptious! Thank you for the recipe! Hi Indy, can you just use plain water instead of chickpea water? Hi, do you use Chickpeas in spring water or brine?